Soar. Explore. Discover. Are you ready to make the most out of your summer break? The Grauer School’s summer school program is designed to provide learning, enrichment, and of course, fun throughout the summer! We help students explore their academic and creative interests in our unique, relationship-driven college preparatory environment. We offer week-long Enrichment Camps for middle school and high school students, as well as For-Credit Academic Programs for students in grades 8-12 who want to get ahead or get caught up during the summer. All of our summer programs are available to students throughout San Diego County, not just current Grauer School students. Standard enrollment for the first session closes on June 19, and enrollment for the second session closes on July 10. We invite you to take some time and browse through our exciting and enriching summer school programs. Click on the quick-links below to enroll a student in one of our Enrichment Programs, download the application forms to apply for a For-Credit Academic Program, or ask us a question. We are excited for you to join us this summer at The Grauer School! Week-long Enrichment Programs are designed to encourage intellectual curiosity and challenge students to try something new during the summer. Our camp instructors are Grauer teachers or other adults who are experts in their fields. The cost of each camp is $250 per week with a $25 non-refundable enrollment fee. Enrolling in three camps qualifies families for the discount rate of $700. There is an enrollment minimum of 5 students and an enrollment maximum of 10, unless specified otherwise in the camp descriptions below. Join us for an exciting and fun-filled week of technology with Robots and Drones! This camp is for Middle School students entering 6th, 7th, and 8th grades in the fall, and the camp is open to Grauer students and students from other schools. Students are welcome at all knowledge levels, whether you’re just learning about robots, drones, and programming concepts for the first time, or if you already have some experience and want to learn more. Our robotics camps are engaging and educational. It’s such a fun challenge to make a robot run through a maze or make a drone fly through the air using code that you programmed yourself! We’ll start off the week by programming LEGO Mindstorms robotic vehicles. Beginners will start with basic programming lessons, and more advanced students will refresh their knowledge and add enhancements to the robots. We’ll complete the Robot section with everyone running the robots through mazes and competitions together. This knowledge will give students a big head start if they’re interested in joining a First Lego League (FLL) team or similar robotics program at their school during the school year. The Drone section of the class will start with programming lessons to learn how to make the drones fly. You’ll learn all about pitch, roll, and yaw, and learn to think like a drone pilot! We’ll start with block programming for basic drone commands which is ideal for beginning programmers, and we'll move on to use more advanced commands to program the drone’s actions. Everyone will participate in fun interactive activities with the drones. During the week, the students will learn about video production techniques that they will use to shoot video of their robot and drone maneuvers. For the final activity of the week, students will use multimedia programs to edit their video clips and create a spectacular video of their activities during the week. Prepare for a fun and educational week! This cost for this camp is $250 with an additional Materials Fee of $30, for a total of $280 per student. This camp has a maximum of 10 students and it fills up quickly, so we encourage you to sign up early to reserve your spot. Join us for an exciting week of intensive FIRST Tech Challenge (FTC) Robot Construction! This camp is for High School students entering 9th through 12th grades in the fall, and the camp is open to Grauer students and students from other schools. Students are welcome at all knowledge levels, whether you’re just learning about robotics, or if you already have some experience on an FTC Robotics team and want to learn more. 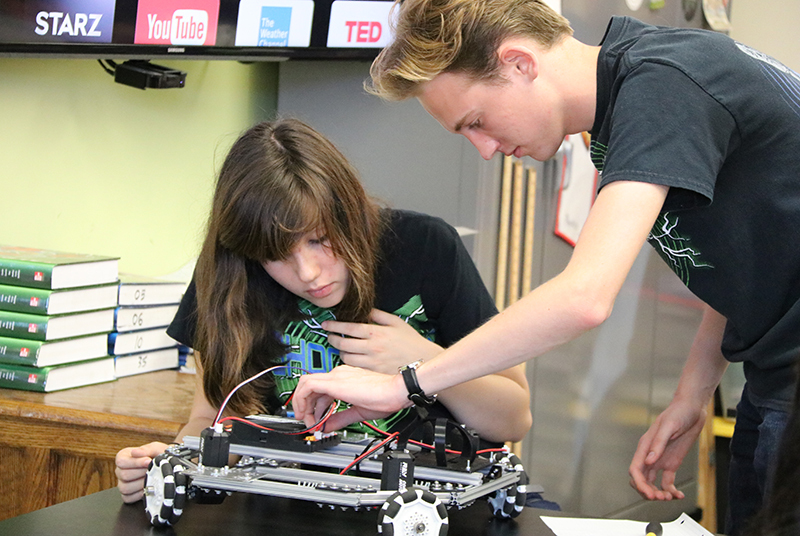 During this weeklong Robotics Boot Camp, students will build a fully functional robot using FTC-approved parts and programming. Each student will learn all aspects of hardware and software design that goes into building a functional FTC robot. Students will work in small teams to design, build, and program an FTC robot from the ground up. FTC robots can be up to 18" in length. The robots will be built using the following parts: Extruded Aluminum Frames, REV Expansion Hub Robot Controllers, Cell Phones, and REV motors with encoders. This Boot Camp program is designed to provide a comprehensive overview so students will have a working knowledge of each aspect of the FTC Robotics program. This will give them a big head start if they’re interested in joining an FTC team or similar robotics program at their school during the school year, because they'll be able to step in and take on any of the roles on their robotics team with confidence. If you're interested in robotics and want to get some hands-on experience in programming and building advanced robots, this is the program for you! This cost for this camp is $250 with an additional Materials Fee of $60, for a total of $310 per student. This camp has a maximum of 15 students and it fills up quickly, so we encourage you to sign up early to reserve your spot. Discover the invaluable resources that surround our community through education, service, and fun! Students will learn all about Southern California ocean health through hands-on practice as surfers and citizen scientists. As part of the course, students will surf some of North County’s best surf breaks daily, and learn about conservation efforts to keep them pristine and biologically-diverse. Enrichment and service activities may include water quality testing, watershed study, Smartfin surfing, and storm drain stenciling. Classes may also include visits to Scripps Institute of Oceanography and San Elijo Lagoon. "I can’t wait to get kids connecting with nature and serving as ecostewards. We want everyone to walk away from this camp thankful for living here." This camp is for Middle School and High School students. No surfing experience is necessary, but students should be strong swimmers. This cost for this camp is $250 per student, and there is a maximum of 12 students per session. Cultivate Your Muse and Unlock Your Imagination! This week-long Creative Writing camp promises to inspire all level of writers whether you're a poet, a short story writer, or a playwright. Our focus will be on finding inspiration in the world around us! Each day, we will take a short walk in nature to wake up our senses and connect to the elements. Among other artistic devices, we will use music and visualization techniques to dive into our own rich imaginations for cultivating ideas about setting, character and plot! Visual art, from collage to found poetry, will also be a way for us to translate our ideas into writing. And, of course, we will write and share and listen to each other in a creative and supportive environment. "I love reminding students that their most inspirational writing teacher is the awakening of their senses with the natural world." This camp is open to all Middle School and High School students, and the cost is $250 per student. Loly Lutti Summer Pottery Camp has partnered with the Nancy Gordon Pottery Studio to offer week-long sessions hosted by The Grauer School from mid-June through mid-August. We provide the option of a Full-Day program from 9:00am to 3:00pm or a Half-Day program from 9:00am-12:00pm. This camp is open to Elementary, Middle School, and High School students. The cost for this camp per week is $375 for the Full-Day program and $275 for the Half-Day program, with a Sibling Discount of 20% per student. Please sign up for this camp on the Loly Lutti website: www.lolylutti.com! At this Hip-Hop Dance Camp, you’ll learn the latest dance routines to today’s most popular songs. Get your friends together for a week of exciting moves and great music. Each one-week session will conclude with a brief performance. This class is for students in 6th grade through 12th grade, and the cost for this camp is $250 per student. We all know the "dab" dance; we all know the "floss" dance. But have you ever wondered who created these dances and why? Every dance we learn has a rich history grounded in the culture and social settings in which it developed. Spend a week this summer learning the newest dances, exploring their origins, and creating your own new moves that just might become 2019’s summer dance craze. From counter-balances to counter-point, dance is full of sculptural forms and architectural designs that pull from math and science. Spend a week dancing to the rhythms all around, using music, poetry, pattern recognition and more to advance your math and science skills through fun, collaborative, creative projects and dance routines. During the week the students have ample opportunity to work on skills and concepts they need to develop, and they will learn ways to be more proficient in their areas of strength, all while having fun in a relaxed, playful environment. Students are able to continue to utilize two of the online math resources after the week concludes for future practice. This class is for Middle School students who will be entering 7th and 8th grades, and the cost is $250 per student. During the Algebra 1 Boot Camp, students have a thorough review of all the topics covered during a typical Algebra 1 full-year course. For each topic, students are presented with an option of either “review the concept” or “try some problems.” If they choose to review, the students are presented with an overview of the topic and several examples prior to trying some problems. After going over the problems together, we determine whether the student has mastery of that topic or whether it is an area for the student to come back and work more on later. We keep a tally throughout the list of all areas mastered and all areas needing extra practice. In addition to reviewing concepts and practice problems, students are able to utilize two online math resources that they can continue using after the week concludes. The combination of brief lectures, example problems, and multiple online resources provides the students with a multifaceted review of the main Algebra 1 topics in a friendly, relationship-driven environment. The cost for this camp is $250 per student. The 21st century student is a year-long learner and not every class is best suited for online or distance learning. By being an active member in one of our classrooms, students can get caught up or get further along the college path with for-credit academic courses, offered for students in grades 8 through 12. We blend the best of a traditional classroom with the exciting frontier of directed, online educational resources. All of our classes are taught by Grauer teachers, with low teacher-student ratios for the summer student who needs extra support. Courses meet UC standards and are approved by WASC. We hold students accountable to the same standards as we do during our normal academic year, so students are expected to demonstrate resourcefulness and self-advocacy. Our summer school classes are open to current Grauer students, as well as students who are not attending The Grauer School (with a $75 non-refundable enrollment fee). Classes are limited to 9 students, so it is important to enroll early. Classes with less than 3 students enrolled will not be offered. A fee of $200 will be added to each semester of any class being taken for Honors credit. Students applying to take a full year of any course for the first time, or any honors-level course, must have a B- or better in both of the past two semesters of that subject area. A copy of the student’s last two semester report cards must be turned in with the summer school application. Be advised that attending two summer semesters (earning a year’s credit) is extremely demanding, for while it does not match the enrichment of the course that is offered during the school year, the rigor remains the same. Grauer School units are accredited by WASC. Units are only guaranteed if the student has permission in advance from his/her school guidance office to take the course. Acquiring permission is not the responsibility of The Grauer School or any of its representatives. Be mindful when registering, as each school or district has its own transfer credit policy and there may be a cap on transferable units. Transcripts will be mailed to your school one week after completion of course(s). Extra copies of transcripts cost $20 each. A non-refundable registration fee of $25 is required for all Enrichment Camps. Final tuition payments are due by May 3, 2019. If you are enrolling more than one student, please fill out a separate application form and medical form and submit a payment for each student you are enrolling. To enroll a student in one of our Summer School Enrichment Camps, you can click on the button below to fill out the online application form and submit your payment via Credit Card. A completed Medical Form must be filled out on or before the first day of class. Click on the link below to download the Medical Form. If you would prefer to pay for Enrichment Camp enrollment with a Check, you can download the Application Form and Medical Form using the link below, and mail your completed forms with your check payable to "The Grauer School" to The Grauer School, Attn: Summer School, 1500 S. El Camino Real, Encinitas, CA, 92024. A non-refundable registration fee of $75 is required to reserve your space in all for-credit academic classes for students who do not attend The Grauer School. Final tuition payments are due by May 3, 2019. Please fill out a separate application form and medical form for each student enrolling in the program. Please click on the button below to download the Summer School Enrollment Forms to enroll in our For-Credit Academic Programs. You will need to mail the completed Application Form with your payment to enroll in any summer camp, and you can bring the completed Medical Form to the first day of summer school classes. Completed applications should be mailed with your check payable to "The Grauer School" to The Grauer School, Attn: Summer School, 1500 S. El Camino Real, Encinitas, CA, 92024. You can purchase Grauer Summer School t-shirts for $20 each in Youth and Adult sizes on our Grauer Gear store. The registration fee is non-refundable, unless your class is cancelled. Notification of withdrawal or changes must be made in writing to the Summer School Director. There are no refunds after May 24. A refund of 90% of the tuition for any course may be obtained prior to May 24, 2019 by written request to Summer School Director Tricia Valeski at triciavaleski@grauerschool.com. The Grauer School reserves the right to cancel a course due to insufficient enrollment. Cancellation of classes will be decided by June 7, and every effort will be made to find an alternate class selection. If an adequate alternative is not available, a 100% refund will be made including any registration fees. For enrollment questions, click on the quick-link below to send an question using our online form, or you can contact our Summer School Director, Tricia Valeski, at triciavaleski@grauerschool.com or 760-274-2116.